It didn't take long for Dom Thompson-Williams to prove himself as a member of the Mariners organization. In his first start since being acquired from the Yankees in November, the M's No. 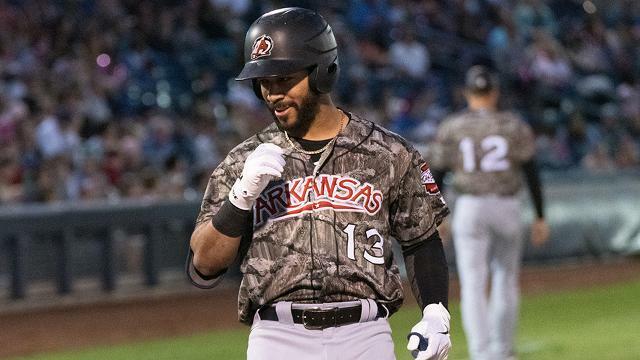 15 prospect homered twice and matched his career high with five RBIs on Friday, powering Double-A Arkansas to a 9-4 win over Tulsa at ONEOK Field. It was an impressive start for Thompson-Williams, who came over in the James Paxton deal along with left-hander Justus Sheffield -- MLB.com's No. 42 overall prospect -- and M's No. 9 prospect Erik Swanson. While that may be the case, however, he's making sure to stay grounded. "It felt really good," Thompson-Williams said. "But at the same time, it's the first game of the season for me. I've been on the other side of that, so you've just got to stay even-keeled about it and try to just keep moving forward and putting your foot in front of the next." Thompson-Williams lined out in his first trip to the plate in the second, but came up again the following inning and drew a 3-1 count against starter Parker Curry. After sitting back on two changeups, he got the fastball he wanted and parked it over the left field fence to plate M's No. 14 prospect Jake Fraley. In his next at-bat in the fifth, the 23-year-old worked the count full against Curry before cranking a three-run shot to right to give the Travelers a 6-0 lead and complete his second career two-homer, five-RBI game. The other performance came last May 13 for Class A Charleston. Last season clearly was Thompson-Williams' best in terms of power, as he belted a career-high 22 homers after totaling six in his first two professional seasons. According to him, the surge was the result of an improved day-to-day routine -- something he looks to build on in 2019. "In BP my first two years, I could always hit the ball out of the park, but I could never translate it into a game," he said. "It'd be times where I'd sit and think -- it wouldn't register -- I'd be like, 'How can I do that in BP and in games it's not happening?' ... If I stay faithful to my routine through good and bad, I think I will be pretty successful." Thompson-Williams was not the only contributor for Arkansas as Nick Zammarelli III and Chris Mariscal homered while going 2-for-5 and 3-for-5, respectively. Mariners No. 26 prospect Ricardo Sanchez got the win, yielding four hits and striking out five over 5 2/3 scoreless innings. Those performances, along with his own, made for an enjoyable start to Thompson-Williams' career in Arkansas. And even though he hasn't been a Traveler for long, he knows that as he and his teammates get more comfortable around each other, the fun -- and the success -- will continue. "It's fun, man," he said. "I'm getting to know these guys a lot, and the (better) relationship that we build the more fun that we will have on the field. I can already tell that it's going to be a really fun season with these guys."